How did I end up to Leiden and how do I feel about it now? I am one of those Leiden bachelor students who attained a degree from another field and some work experience before moving here. 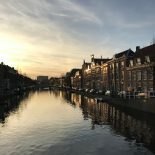 In October, I got to meet my fellow Leidener bloggers for the first time, and our meeting inspired me to tell a bit more about, how I ended up in Leiden and why did I want to do another bachelor’s degree the first place. Four years ago, I was living in my home country Finland, working as a journalist intern and studying journalism. I liked my life in general, but at the same time, I could not shake out an old dream. I knew that I want to study something else, too, (that something being psychology) and I wanted to do it abroad. Hence, one evening I opened Google having one goal in my mind. I wanted to find out where I could fulfill my dream. I wanted to study in Europe and in English. Since England, for instance, was not an option for me, I started thinking about the Netherlands. Soon I found myself reading about the brand new International Bachelor Program in Psychology at the University of Leiden. Frankly, I knew hardly anything about the Netherlands. I had only been to Amsterdam once. All the Dutch people I had met by then were pretty laid back, and culturally, the Netherlands reminded me of Nordic countries. Almost immediately, I decided that once I have finished my current studies, I will send my application letter to Leiden and cross my fingers. I guess it is safe to say that I wasn’t thinking too much, and that strategy seemed to pay off. I have now lived in Leiden for 14 months and haven’t regretted a minute. Moving abroad is far from easy, rather it can be extremely tough with a strange language you don’t get at all, cultural misunderstandings and loneliness. Then again, I could not imagine myself without this experience, without selecting namely this road, and without meeting all the people I have met during the last year. I have had my moments of misery, but in general, for me integrating to the Netherlands has been relatively easy. It has been so smooth that right now I see myself living in this tiny country also after my graduation. Leiden is a small town, but it is very international. You hear Dutch every day, but at the same time, you won’t see a day without hearing English and several other languages. When I started my studies, there were about 130 people from more than 30 nationalities in my class. So whenever you feel homesick, you can be sure that there are plenty of people around you who know exactly what you are going through. For me, the greatest thing about living abroad is that you are forced to move away from your comfort zone – and you learn to know that you’re still alive, in the best case scenario feeling happier than ever. At my gym, there is a slogan on the wall saying that “you only regret the workouts you didn’t do.” I’d say that you will only regret the big decisions you were too afraid to make. Very nice story, now i am preparing my self to be there next year at setember and i hope to achieve this goal. Thank you so much Mauro! It was very nice to read your comment. I wish you all the best while preparing to apply to study in Leiden. If you have any questions, don’t hesitate to ask! As a Canadian, I was very interested to hear your story. Thanks so much for posting it. Hi Leslie! Thank you for comment. Great to hear that you found the story interesting! I love your perspective . I recently visited Leiden and the university and I feel it’s the right choice for me. I hope to achieve my goal and begin my masters next year at Leiden. I too will be moving from abroad and your article was very reassuring for me. Thank you! Thank you for your comment. That’s great to hear! Often, you can rely on that gut feeling that some place gives you. I also got a good feeling about Leiden the first time I visited the town. I will keep my fingers crossed for you! Have a nice spring! This entry was posted on November 16, 2016 by ajhaapala in Study.